Come sit with me in the garden and we'll talk about lawns of clover, fresh-picked peas and the scent of lily of the valley. We'll remember when it was once warm as we watch the birds peck at frozen seed and suet at the nearby bird feeders. There are cardinals and starlings and morning doves taking their turns. Come sit with me in the garden, and we'll talk about how much work it is to shovel snow off a driveway and what will happen when all of this snow melts. We'll make plans for spring and summer and try to guess when the first crocus will bloom and where it will be. It could be in the front flower beds or out in the lawn, where 2,000 corms wait below the snow for their time. Come sit with me in the garden and will speculate about garden fairies and pilliwiggins and see if we can see any under the nearby spruce tree. We'll look for rabbit tracks and vole trails and discuss if the chicken wire fencing around the young apple trees and honeyberry shrubs is high enough to protect them from hungry wildlife. Hopefully, it is. Come sit with me in the garden and we'll marvel at the quiet beauty of a snow covered landscape. Then we'll go back inside and smell the lily of the valley blooming in the kitchen window and check on the microgreens growing under lights in the sun room. We'll warm ourselves by the fire in the fireplace, grab some seed catalogs and forget the snow and cold, at least for now. It's time to plan for spring. Beautiful winter picture you have - weather conditions looks pretty similar to mine although we don't have as much snow. 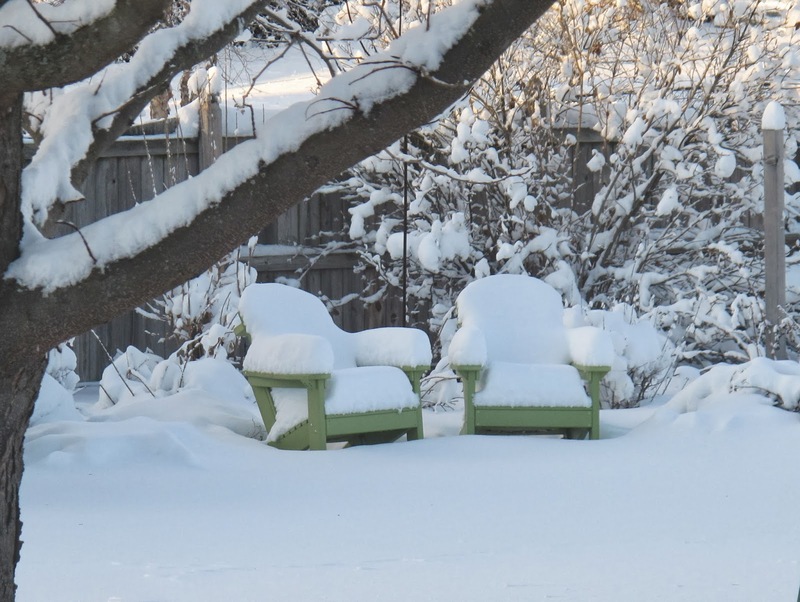 Those chairs do look so inviting, but since I don't have a snowsuit, perhaps we could sit inside instead?